The house from the Brady Bunch, one of the first and most famous examples of contemporary design, was recently the subject of a bidding war between television producers, corporations and entertainers. In the end, HGTV submitted the winning bid of $3.5 million and plans to restore the iconic home to its original 1970's glory. While looking at the Brady's house may seem like a walk down memory lane, in terms of style, the house features a few mainstays of contemporary design that can still be incorporated into any modern home. These characterisitcs include an open concept, plenty of light, and clean lines with simple designs. From classic mid-century design to today’s modern structures, contemporary homes combine beauty and practicality. They often combine form and function to create stunning aesthetics. With the right wood door, you can extend that beautiful contemporary look into the entryways of your home. Let's take a look at some of the defining characteristics of contemporary home design, and how wood doors can not only complement, but even enhance those features. One of the most defining aspects of contemporary design is simplicity and smooth, clean lines. A contemporary flush or full panel door from Simpson matches that aesthetic, all with the quality and craftsmanship you have come to expect from us. Embrace the bold architectural features of modernism without sacrificing the warmth and durability of wood. Large windows and well-lit interiors are a central tenant of contemporary design. They help to create an inviting space within the home. You can extend this look from your walls and into the entryways of your home with a Simpson door containing textured glass. For an even more striking visual impact, you can use a door made with Clear EdgeTM Technology. These doors feature glass that extends all the way to the edge of the door, creating a unique and beautiful look, while still allowing for ample light to pass through. Looking for a little more privacy? Choose a door with textured glass and your privacy is completely in your hands. In both door types shown above, the glass can be customized to use any texture, and glass type to adjust the opacity of your door. Meaning you have complete control over how much privacy you want with your doors. Anyone who has ever seen a home buying or renovation show knows that an open concept floor-plan is currently one of the most popular trends among homebuyers. By tearing down walls, these open layouts can make a small space feel larger, remove the separation between the kitchen and living room, and are great for entertaining. However, there might be a reason or occasion where you want to separate these spaces. A great solution to this problem is to separate the spaces in your home with large doors on barn track. A wood barn door from Simpson will make a statement in any room, and provide versatility to either join, or separate spaces in your home. 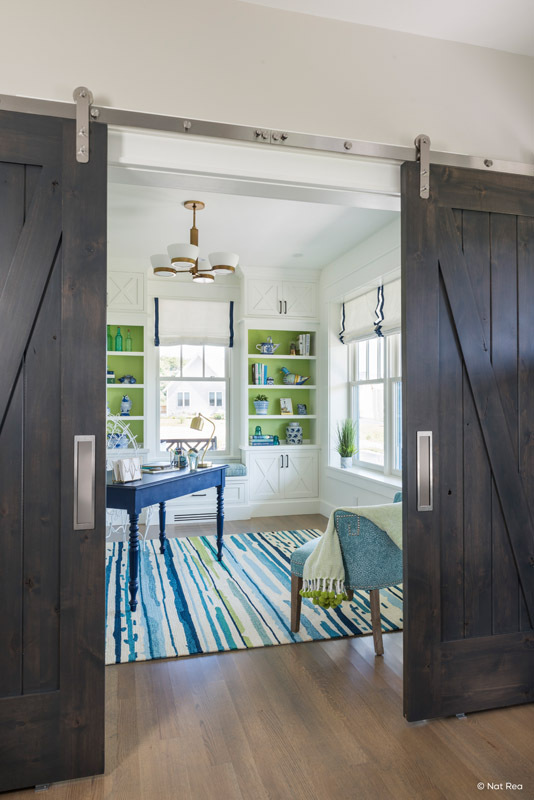 These doors can be mounted over a wide entryway on barn track hardware to create a large, airy space when opened, yet allow for privacy when closed. While any Simpson door can be used in a barn track application, doors that look like they belong on a barn are a popular choice. Simpson Barn Doors are available in a variety of sizes and designs so you can pick the perfect match for your home. One of the best aspects of modern contemporary design is how no two homes are completely alike. Just like a Simpson door. Every door from Simpson is made from real wood, and completely customizable, so each door is unique. Our doors can be made in any shape, any size, any type of wood and with any type of glass. So you can create a contemporary door that is as unique as your home. Really a great design and learning about good design, really appreciated your creativity and overall projection of ideas...thank you and keep sharing.